(Newser) – For years, birth control pills have been linked to an increased risk of breast cancer, though newer drugs containing smaller doses of estrogen and progestin were assumed to be safer. A new study suggests they aren't. 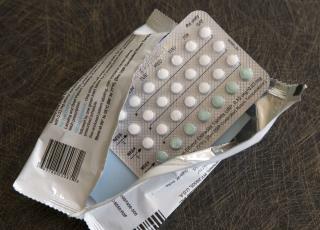 Researchers in Denmark reviewed public health records for 1.8 million women, using prescription data to identify users of hormonal contraceptive drugs, including intrauterine devices that release progestin alone, reports Bloomberg. Overall, the risk of breast cancer for these women was 20% higher than for those who never used contraceptives, a similar rate as for women who took older versions of the drugs. Though it's a small increase—representing one extra case per 7,690 women—it's enough that study author Lina Morch suggests women who have a strong family history of breast cancer consider other birth control methods. I don't think that's a new finding. Birth control pills' effect being based on hormones is not surprising. The use of intrauterine devices, located far from the breasts, still causing breast cancer, indicates it has to be something that flows through the body acting there, and that includes hormones. Hormones are extremely powerful. Any interference with their normal flow can be dangerous. Which means there is another source of breast cancer risk. Abortion. When a woman gets pregnant, the hormone balance in her body changes dramatically. An abortion interferes with this, destabilizes what is intended to be at least a temporary normal condition. If the other situations can cause breast cancer, that can, too. Shills for abortion by craven whim, the real name for “abortion of demand”, will insist that abortion has no connection to breast cancer. In fact, this is an engineered lie. The vast majority of abortions occur in the store front “clinics”. A defining quality of the “clinics” is that they never keep paperwork. Therefore, among other things, there are no connections between going to a “clinic” and developing breast cancer later. It can't be said necessarily that a woman did not get breast cancer from an abortion because there are no records kept by “clinics” to prove that she ever did visit one. So is Sandra Fluke now going to sue FOR having providing free contraceptives?